Join us in the Camphill Ghent Hall on Monday, February 25, at 3pm, for a very special afternoon treat! 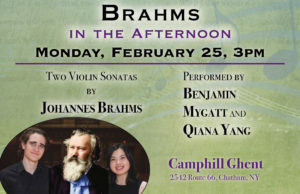 Williams College music (and math) majors, Benjamin Mygatt and Qiana Yang, will gift us with performances of two violin sonatas by Johannes Brahms. Benjamin Mygatt is a native of Raleigh, North Carolina majoring in music and mathematics at Williams College. Ben started playing violin at the age of 5 under the Suzuki method and later studied with Dovid Friedlander of the North Carolina Symphony. At Williams, he studies with Joanna Kurkowicz, Concertmistress of the Boston Philharmonic Orchestra. He is a co-founder of the Axxea Quartet, a group which had the opportunity to play at Lincoln Center in February, 2018, as part of the ICMF festival. Ben is also a member of the Chamber Orchestra of Williams and the Berkshire Symphony. This past spring, he was a winner of the Berkshire Soloist Competition, playing the Shostakovich Violin Concerto in A minor. In his free time, Ben enjoys rock climbing and basking in the music of Bach, Mahler, and Alma Deutscher (and, of course, Brahms). Ben plays on a mystery instrument made of wood generously on loan from his parents. Qiana Yang is a rocking female pianist majoring in music and mathematics at Williams College. She started playing the piano at age 4 and is currently studying with Elizabeth Wright. In college, she became deeply committed to chamber music. Recently, she won the 2018 Berkshire Soloist Competition with the Schumann concerto. She is an alumna of Meadowmount School of music, where she studied with Eric Larsen and Ann Schein. In the past summer, she studied collaborative piano at Aspen Festival and School and was the youngest pianist in the program. Her absolute favorite pieces of music are the three Brahms violin sonatas; she would still be content with her life if all she could play are the three sonatas. In her free time, she enjoys reading, research, keeping a vivid dream journal, and hiking at 5 am in the morning, despite her inability to walk downhill without falling.